I was recently giving driving lessons to a really interesting guy who works in the advertising industry. During the course of our lessons he told me that he had recently attended a party where a car was the prize for a winner who had come through a series of forfeits and games of chance. Nothing so predictable as a new Clio, Fiesta or something equally dreary. 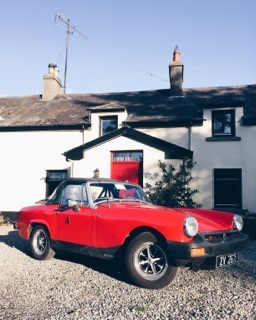 Once copious amounts of free alcohol and food were polished off the winner went home with a beautifully restored 1975 MG Midget and a cheque towards it’s future upkeep. (Why don’t driving instructors get invites to this type of party?) Great night by all accounts and what a prize, it’s sure to live long in the memory of the feckers, sorry slip of the keyboard I meant to say lucky people who did get invitations to this knees up. 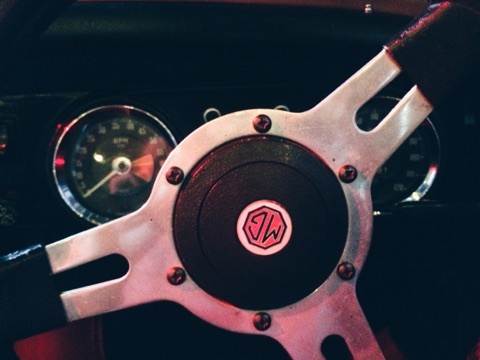 Sam’s late model MG Midget. I especially like the old school alloys. Why don’t I get invites to parties like this? Sam was that lucky winner and he talked enthusiastically of his new car. How he felt he was really controlling something, of the car being almost alive, how close to the the world around him actually was (approximately 2mm of 40 year old steel and equally elderly canvas separating driver from his surroundings). 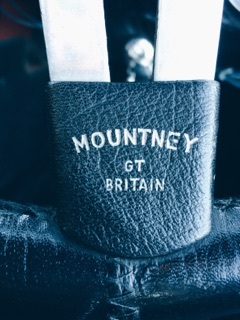 Of double clutching dropping gears (this must have been the only car in the world in 1975 without synchromesh!) and feathering the choke on a cold morning. 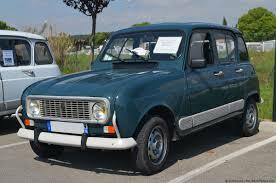 This got me thinking about two things, firstly my own early driving experiences in a Renault 4GTL (named Cynthia) which in a great many respects wasn’t all that different from an MG Midget. 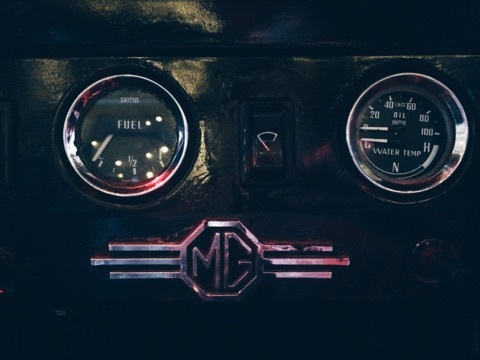 I admit that the car I began my driving career in had more seats, a metal roof and perhaps not quite the sporty 6 inches off the ground tiny profile the MG possesses but stick with me for a moment as I summon a coherent argument. Both were vehicles you did not want to be “protected” by in the event of even a minor accident. Four teenagers could (and did) easily lift either car and turn it around. Electrics could not be relied on in either car, I have vivid memories of heeling and toeing, not to exit a corner quickly but to keep the revs up at all times in the little French hatchback if the wipers, radio and heater were simultaneously in use and watching the ammeter continue to drift alarmingly to the left. At this point the radio would be switched off and you would have to choose whether to have your windscreen obscured by either condensation on the inside or water on the outside. Vigorous wiping of the glass and alternating between the wipers and heater would usually allow a portion of the already tiny rectangular windscreen remain clear enough to avoid most obstacles. Have you ever seen a smaller windscreen? The second and more pertinent thing I started to think about was how separated modern drivers have become from both their highly complex machine and their fellow road users. Car manufacturers realise that driving is a highly skilled multi sensory discipline that demands knowledge, skills and innate abilities that are far and away beyond the capabilities of the average person they want to sell cars to. Obviously they can’t do much about the idiot behind the wheel but they can do a lot to make the cars easier to drive, less likely to crash and to mitigate the effects of the still inevitable coming together of two expensive metal boxes. Power steering and brakes numb us to the actual forces required to change speed and direction leading even experienced drivers to become complacent, forgetting the huge kinetic energy constantly lurking just waiting to get us in trouble. Auto hold and release handbrakes (available now even on many basic models) mean some people I teach can’t even recognize that they are on a hill and is rapidly eroding the important and beautiful art of clutch control. Auto braking at low speeds, blind spot warning buzzers, stability programs, adaptive cruise control, self parking cars and lane departure warning systems are just some of the “safety features” available (often as standard kit) on more and more cars. Each of these features in itself is a great piece of equipment providing the driver knows what the aid is doing and doesn’t rely on it for day to day driving. The problem is drivers often realise that the risks have been mitigated and compensate for this by driving in a more dangerous manner, negating the built in safety margin leading to manufacturers coming up with even more innovative ways to make cars “safer”. What a vicious cycle. 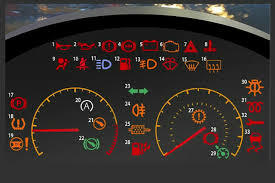 Even worse though is the exponentially growing cohort of drivers who remain blissfully unaware of what is going on under their bonnet and more and more importantly the responsibilities their ECU has seen fit to assume. Not being aware of what’s happening means being unaware of approaching the limit. Being unaware of approaching the limit….. This is the type of “driver” we are going to see more and more of as cars take more and more decisions and drivers become more and more detached from the world around them. Exacerbating this problem are the plethora of screens drivers are looking at instead of the road. From a satnav suckered to the windscreen with it’s power cable dangling towards the cigarette lighter through the ubiquitous smartphone to the ever enlarging tft screen protruding from the dash on every new car it’s amazing the driver has any spare acuity left to actually look out the window! Make no mistake autonomous cars are coming, the only questions are who decides and when. (It will be a truly sad day, let’s enjoy every moment of driving pleasure while it lasts). Driving will become a pastime a little like horse riding has become over the last century. We are however in a period of transition (a period that will last at least two decades) and we are going to become further and further removed from what our cars are actually doing whilst remaining in charge of and responsible for over a ton of metal moving at speed. In this respect we are approximately 30 years behind perhaps the most safety conscious industry going. Aeroplanes have been able to take off, navigate and land safely autonomously for many years. Despite this every single manned flight remains the responsibility of a highly trained, skilled and regularly tested (both for competence and health) human being. Despite this constant testing and training lack of real world flying skills can lead to pilots being slow to sense danger and lack quick suitable reactions to dangers as they present. It has even been strongly suspected to be responsible for some plane crashes. The Air France flight from Rio to Paris that disappeared into the Atlantic was found to have stalled. Despite a stall warning the pilot continued to raise the nose of the aircraft further slowing the plane causing the wings to fully stall. The plane dropped like a stone. You would expect a pilot used to actually flying would have instinctively dropped the nose avoiding any incident. Maybe everyone should learn to drive in a car with no safety features at all? Passive safety features like seatbelts, airbags and crumple zones are of course lifesavers but they also can lull people into thinking that a crash might hurt the car but not them. Seatbelts are proven to be bad news for pedestrians as drivers feel safer. Writing this post made me think of another former pupil of mine, Danny, (another guy I really enjoyed teaching). He told me about an “ingenious safety device” he had heard of and it has always stuck in my mind. This device? An extremely sharp spike in place of the airbag on the steering wheel! A little interweb research credits the idea to one of two dismal scientists, either Gordon Tullock or Armen Alchian. I have to confess to never having heard of either but I’m pretty sure their idea would probably temper the enthusiasm of even the most dedicated boy racer. I’m not quite sure I fully agree with Danny and his interesting road safety measure but there is definitely something to be said for making drivers feel less comfortable and safe whilst in control of a potentially lethal machine. Returning to L.J.K. and his two pillars of competent driving. Even those with an innate ability and feeling for driving will still not reach their potential as a lack of real world practice will lead to rusty skills and lazy shortcuts. Even the most talented athletes train hard. However the appalling vista opening up before us is the thought of people who don’t have a natural feeling for what their car is doing becoming even further removed from driving yet remaining in charge of their car. Will all the safety aids in the world keep them and the rest of us safe? I certainly hope so but remain to be convinced. Good point Greg, today addictedtocars.com, tomorrow the world!